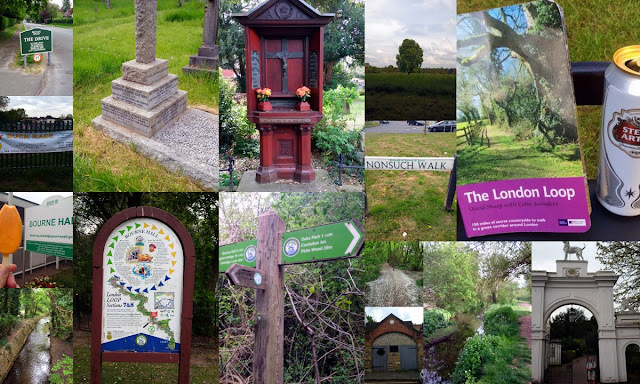 This post is a little late and off message but the weekend after the May 5 elections I resumed my attempt to walk around the London Loop route from last year. The London Loop is a 150 mile circular walk around London split into sections. I had hoped to complete the whole walk last year but only managed to do the walks 1-5. The further away from East London the more difficult it was to get to get to and fro the start and finish of each walk. This time I decided to do one Loop walk on the Saturday and stay over for the night then do the next walk the following day (Sunday). It was about 11 miles. It was a nice walk but mostly urban and suburbia. Tudor Nonsuch Park and Palace was pretty and interesting but the main path along the river Hogworth was a bit disappointing. Ewell was well worth a visit with the Roman remains and the Village Jail. Brought refreshing ice lollies at Bourne Hall. There was beautiful tree blossom throughout the route. May is a wonderful time of year to go walking. The best part of the walk was the ending in Kingston upon Thames. There was a Airbnb apartment just off the route and 10 minutes walk from the centre. Kingston is lovely and had a great meal in a restaurant next to the river in the evening and was able to carry on route 7 the following day (Sunday).